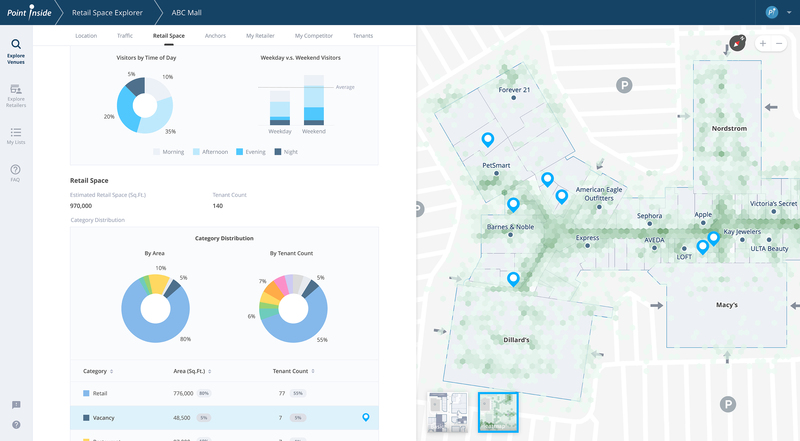 Retail and airport leasing associates, property managers, retailers and marketers soon will have critical data points on how visitors use their properties, with the formal launch in May of Point Inside Inc.’s “Retail Space Explorer” tool. Already known for its Digital Twin indoor mapping technology, Point Inside has added never-before-seen depth of data to its newest research tool. Called the Retail Space Explorer, it helps users evaluate critical leasing, site selection and promotional programs, says Jon Croy, co-founder and CEO of Point Inside. These include retailer adjacencies, the percentage of space allocated to various categories, such as food and beverage, retail and services, distances to foot traffic influencers, such as anchors, elevators and entrances as well as competitors, and more. Retail information includes visits by store, average store sizes and locations, and vacant space available for lease. Point Inside’s proprietary data cover 1,200 enclosed malls, dominant open-air centers and airports around the U.S. and internationally. A leasing manager can define the factors that affect tenants’ success, including the proximity of competitors within a user-determined radius, walking time between competitors within the center, and the distance to other traffic generators including parking, elevators, key stores (such as Apple) and more. An additional data point ranks the popularity of the stores within the venues by utilizing cell phone data – Mobile Advertising ID (Mobile Ad ID or MAID) – to see how many people entered or exited a location, and how long they spent inside each store. Point Inside also uses additional proprietary technologies to differentiate customer visits to stores located on multiple levels within the same coordinates (latitude and longitude). Retail Space Explorer subscribers can also upload their proprietary data into the tool confidentially to track other measures, such as lease expiration and sales by individual stores. “We will overlay that data with the mall footfall data and create a heat map that shows relative popularity among stores. This will give our users a true picture of how customers are interacting with their properties,” Croy added. The results will allow developers, retailers and marketing staff to assess adjacencies for optimum location in their leasing and relocation strategy. Retailers can assess the presence of competitors both inside the project and nearby. “We drill down to the most minute details. For example, we have found that 23 shopping centers in the U.S. have a MAC store within a 20-second walk of a Sephora. We can also exclude stores – you could then search for projects that don’t have an Ulta nearby. This comparative research is available for all retail categories, and allows retailers to best determine their optimum locations well before they commit to a lease,” Croy says. In addition, Point Inside can provide to subscribers the actual MAIDs of shoppers who visited a specific store, or category of stores. Marketing staff can use that data to determine how the customer interacts with various events and promotions. That information also can allow them to target thousands of their customers and even competitors’ customers with personalized digital messaging across multiple devices and on Google searches, Facebook activity and other sites. The level of detail – about everything that happens in a retail setting – available through Retail Space Explorer is extraordinary. “We don’t just provide where a store is. Through Retail Space Explorer, we can tell a manager the number of people who have visited five stores they’ve designated. Our information is that granular,” he said. Previously, this data would only be available by visiting a site and nearby centers, Croy continues. Instead, Point Inside’s team undertakes these visits for its clients and updates the information continuously, helping them progress from basic knowledge to insight as to how visitors are using their properties. The Retail Space Explorer is an evolution of previous tools from the 10-year-old company. Founded as a mapping service, Point Inside now offers strategic geospatial services that include StoreMode, which maps store interiors to help determine the best placement of merchandise; Day of Travel, which provides a detailed guide to services and items available at more than 250 airports worldwide, and IndoorData.io, a system to capture and collate Internet of Things data signals at a location and display them on an indoor map. Developed over the last year, the Retail Space Explorer was beta-tested to a small group of users beginning in February, and will be feature-rich and ready for launch this May. Currently cloud-based and accessible at https://www.pointinside.com, the tool is designed to be accessed via desktop and mobile web, giving the same critical data insight to professionals in the field. Jon Croy: Jon Croy is the CEO and Co-founder at Point Inside. He has held a variety of senior management roles in high-technology and wireless companies, with responsibilities including executive management of sales, marketing, finance, engineering, information technology and operations.